Send your prisoners to their cells. Bangup is an Emergency command that the player can use to maintain order in their prison. Its primary function is to send all willing Prisoners back to their Cells, which is a good way to lessen the power of a potential Riot. It can also help the player find out which prisoners are about to Misconduct, because troublesome prisoners who ignore the Bangup order usually start problems. If you believe a riot is about to occur in your prison, then it would be a good idea to use Bangup to reduce the overall potency of the riot because the more prisoners that join in, the harder it is to control. Additionally, the player can also employ the use of the Lockdown Emergency Action to isolate a riot, and prevent it from spreading to other parts of the prison. Keep in mind that frequent bangups can irritate and annoy your prisoners, so use only if you believe a riot is about to occur. Once the player hits the Bangup button, all prisoners are told to immediately drop what they are doing and return to their cells. This also includes prisoners who are working. The Regime is completely ignored and prisoners are to stay in their cells until bangup ends. All visitors will also leave the prison. 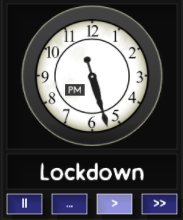 Additionally, the clock will also display "Lockdown" instead of the current regime schedule. Bangup will only end when the player chooses it to end. When a prisoner enters their cell during bangup, the cell door will automatically close. Eventually, prisoners will not like the fact that they can't go outside their cell and will quickly become angry depending on their Needs. Just like other emergency actions, Bangup can be turned off at any time at the command of the player. This page was last edited on 21 November 2016, at 13:16.